"Wildflowers and Weeds of Kansas" has been selected as recipient of the 2016 Jan Garton Prairie Heritage Book Award. The book was authored by Michael John Haddock, an associate dean at K-State Libraries, in conjunction with Craig C. Freeman and Janét Bare. The award, in honor of Jan Garton, 1949-2009, is given annually to the best book that illustrates the heritage of North America's midcontinental prairies, whether of the tallgrass, midgrass, or shortgrass regions. Garton, a native of Chapman, was known for her efforts to save Cheyenne Bottoms, the largest wetland in the Great Plains and a critical shorebird migration point. Garton led a successful fight to restore water rights to this central Kansas wetland and was a lifelong advocate for the prairie. The endowment for the Prairie Heritage Book Award comes from a bequest to Prairie Heritage from the estate of Jan Garton. 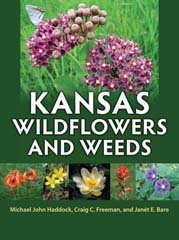 "Wildflowers and Weeds of Kansas" was published by the University Press of Kansas and contains descriptions of 1,165 species representing 56 percent of native and naturalized species currently known in Kansas as well as 742 color photographs. It also was a recipient of a 2016 Kansas Notable Award given by the State Library of Kansas. Haddock, who supervises the research, education and engagement division at the K-State Libraries, also is the author of "Wildflowers and Grasses of Kansas: A Field Guide," published in 2005.